The Trump administration is revising a 22-year-old federal regulation that has enabled states, with the help of a left-wing political organization, to acquire waivers exempting able-bodied adults without dependents (ABWDs) from having to work or undergo job training to receive taxpayer-funded benefits such as food stamps. Reforming the rule will reduce the taxpayer burden and enable more individuals to move from federal dependency to self-sufficiency, according to the administration. During a Congressional hearing addressing Supplemental Nutrition Assistance Program (SNAP) fraud earlier this year, Rep. Jim Jordan, R-Ohio, asked the politically left advocacy organization, the Center on Budget and Policy Priorities (CBPP), why it was working with state agencies to seek work requirement waivers for large geographical regions in state with low unemployment. Stacy Dean, a CBPP vice president, said at the Subcommittee on Healthcare, Benefits, and Administrative Rules hearing that CBPP "has been working with states on this issue since the rule's passage in 1996 and has significant experience on waiver eligibility criteria." CBPP has provided assistance to every state under both Republican and Democratic leadership to group low-unemployment areas with higher unemployment ones so the entire combined region meets U.S. Department of Agriculture (USDA) waiver requirements. Dean maintains that CBPP does not charge states for its assistance and does not receive compensation from states. "We have record low unemployment, with a record high number of open jobs, and yet more than a third of the nation lives in an area exempt from the work requirement," Congressman Jordan said at the hearing, questioning the need for such widespread waivers. With so many job opportunities available, he asked why the waiver program was being so aggressively used and if states could instead focus on more local exemptions in high unemployment areas only. At issue are "geographic area waivers." Waivers are approved based on data provided, which include combined unemployment data from contiguous counties producing aggregate averages in order to meet the criteria. A 2008 revision of the federal regulation bases the work requirement on the likelihood of employment in a particular area generally determined by the area’s unemployment rate. The higher the unemployment rate, the more likely the area can waive the work requirement. If the areas were not combined, the totals might not meet the waiver criteria. In that case, in order to receive SNAP, recipients would be required to work at least 20 hours per week or undergo job training. Waivers permit recipients to receive benefits for 12 months without having to work. Because of how the regulation is written, the USDA is required to waive the work requirements, even when combined unemployment data includes regions that have unemployment rates well below the required benchmark. "Geographic-area waivers of work requirements for people who receive food stamps are based on the flawed premise that when the unemployment rate in a given area exceeds a certain level, even in a national economic boom, able-bodied people in that area should not be expected to look for work, whether in that area or in a neighboring city or county," Jamie Hall, a senior policy analyst in empirical studies at The Heritage Foundation, said. "Geographic waivers are not needed to protect vulnerable citizens’ access to food. Other provisions exist or are available to give states the flexibility they need to provide exemptions from the work requirement for people facing difficulties." The Trump administration is revising the federal code governing these waiver requirements. "Moving forward, FNS will be taking actions to support the Administration’s priority to provide able-bodied Americans a path to self-sufficiency," U.S. Department of Agriculture letters sent to state agencies state. "This goal requires that we establish a clear and mutual commitment to moving SNAP participants to meaningful employment." Earlier this year, contention over the work requirement for SNAP recipients delayed passage of the 2018 Farm Bill. Republican-led House proposals included stricter work requirements and a mandate that governors sign off on waivers. The U.S. Senate rejected the House version and passed its own without the stricter work requirements. CBPP, which "analyzes the impact of federal and state government budget policies from a progressive perspective," was founded in 1981 and is funded by George Soros-funded Open Societies institutes and numerous globalist organizations. It has been working with state agencies since the law was revised in 1996. Several days before President George W. Bush was sworn into office, the Clinton Administration implemented a rule under Title 7 of the Code of Federal Regulations specifying how ABWDs could circumvent the work requirement to receive hundreds of millions of dollars in SNAP benefits. Hall notes that the system has failed to meet the goal of helping low-income individuals and communities. "Waivers become available well after the economic conditions that may warrant relief from a work requirement narrative and then continue well after those conditions have passed," he said. Under the current system, waivers are tied to the local and national unemployment rates from the past two years, which is out of sync with the business cycle, Hall added. 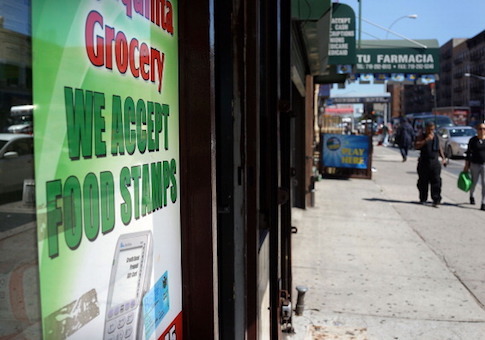 He points to a study that estimates that 63.2 percent of able-bodied adults without dependents receiving SNAP were through geographic-area waivers, with 13.3 percent receiving a different kind of exemption from the work requirement. Only 23.5 percent fulfilled the work requirement in 2016. "ABAWDs exempted from the work requirement by geographic-area waivers account for about twice the share of the SNAP caseload as would have been expected if these behavioral responses to policy were ignored, making addressing geographic-area waivers a more pressing policy concern," Hall said. Rep. Jordan suggested that areas with record low unemployment rates should not qualify for waivers, which he stated were originally meant to provide assistance to low-income individuals and communities during periods of economic crisis, not for the long-term. Hall adds that "rather than tweak geographic waiver formulas, Congress should eliminate the waivers entirely." If combined with other reforms, ABWDs would be better able "to enter the workforce even if they currently live in the least-prosperous areas of the country," he adds. This entry was posted in Issues and tagged Food Stamps, SNAP. Bookmark the permalink.